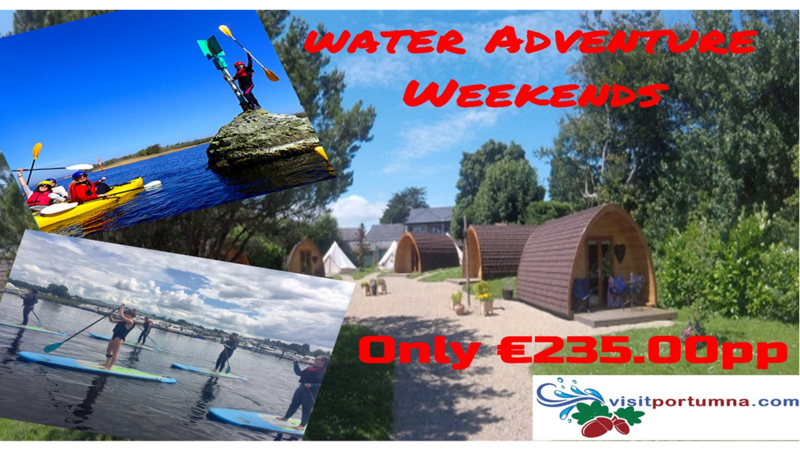 Glamping, Breakfast, Bike Hire, Kayaking, Stand Up Paddling and adventure. Expect a busy weekend, first it is off to the beautiful Podumna Village Glamping Pods which will be your residence for the weekend. Stay in Podumna’s ‘Pods’ which are set in a tree-lined village landscape. They are charming, very comfortable and functional. Making a great daytime base, each Pod is fully insulated, comes with mattresses, power and heating, along with its own deck area, complete with table and chairs. Full Irish Breakfast or whatever gets you going each morning in the wonderful friendly Blas restaurant. Bike Hire supplied for the two days, to let you discover the beauty of Portumna Forest Park, Portumna Castle and lots more in the area. Explore and Tour Lough Derg in a Kayak adventure with Canoeing Ireland instructors. Includes all equipment, photos and refreshments. You decide whether you want to do as the adventure is super flexible and are completely open to suggestion for any variety of experiences that you could want, providing the likes of white tailed eagle watching, island hopping, bushcraft and raft building. Two hour Stand Up Paddling Safari of Portumna and the River Shannon. Package includes SUP Boards, wet suits, buoyancy aids and qualified instructor. This two hour SUP Safari begins at the Mid Ireland Adventure base at Portumna Bridge.Before we hit the water one of our instructors will give a safety briefing. We then will paddle up to where we will play some games with the group and show them some of the wildlife that can be seen from the river. This package is available midweek and at weekends.